Thousands of people turned out to see a Cold War bomber's first flight at an airshow in 15 years. The Vulcan, which cost £7m to restore, flew in a five minute display at The RAF Waddington International Air Show in Lincolnshire on Saturday. The Civil Aviation Authority gave permission for the plane to fly from its base in Bruntingthorpe in Leicestershire on Friday. About 125,000 people turned out to see the Vulcan's milestone flight. A total of £2.7m funding also came from the Heritage Lottery Fund. 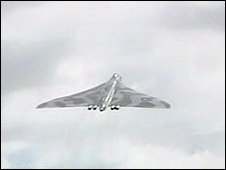 Pilot David Thomas said it was hard work flying the Vulcan. He said: "The cockpit is very small and gets very, very hot so by the time I've done that five minute display, I'm really covered in sweat." As well as the RAF Waddington show, the Vulcan has been given the green light to take part in the Royal International Air Tattoo in Fairford, Gloucestershire, and the Farnborough airshow in Hampshire. Dr Robert Pleming, from the Vulcan to the Sky Trust, said: "I feel so proud. "Of course this is a massive team effort, not only my own relatively small team but all the companies around the UK and the tens of thousands of the public who have supported us. "It really is the people's aircraft." The Vulcan was restored over a 15-year period in Bruntingthorpe but RAF Waddington was its home when it was operational. Earlier this year, the aircraft passed its first inspection - equivalent to an MOT for planes - at the airfield where it has been kept since being decommissioned in 1993. Designed in 1948 by Roy Chadwick, the aircraft could travel at speeds of up to 645mph and was capable of carrying nuclear bombs. There were 134 Vulcans built and the plane also saw action during the Falklands conflict.